St. Martin's Day Croissants – rogale świetomarcinki or simply marcinki – are eaten in Poland on Nov. 11, St. Martin's Day (celebrated throughout Europe), which also happens to be Polish Independence Day. Unlike French croissants, they are crescent-shaped sweet rolls with a poppy seed-almond filling. White poppy seeds are traditional, but they're hard to come by, so regular ones work fine. This recipe calls for 3 egg yolks, so freeze leftover egg whites and save for leftover egg white recipes. SHORTCUT: Use 1 pound purchased sweet-roll dough, thawed, instead of making your own dough. In the bowl of a stand mixer, combine 2 1/2 teaspoons yeast (equivalent to a 1/4-ounce packet of yeast), 1 cup lukewarm milk, and 1 tablespoon sugar until yeast has dissolved. Add 3 large room-temperature beaten egg yolks, 1 cup confectioners' sugar and 4 ounces melted lukewarm butter to bowl and mix. Add 4 cups flour and knead thoroughly until dough is smooth and starts to blister, 8 to 10 minutes. Transfer to a greased bowl, cover and let rise until doubled. Turn dough out onto a lightly floured work surface and divide in half. Working with one dough half at a time, roll each into a 1/4-inch-thick circle. Using a pizza wheel or non-serrated pastry cutter, cut into 8 pie-shaped wedges. In a medium bowl, thoroughly combine poppy seed and almond filings. Place 1 tablespoon filling at the wide edge of each triangle of rolled-out dough and roll away from you. Form rolled-up triangle of dough into a crescent shape and place, point side down, on a parchment-lined baking sheet. Repeat with the remaining triangles. Repeat with remaining half of dough. Cover with greased plastic and let crescents rise until doubled. Heat oven to 375 degrees. Bake crescents about 20 minutes or until golden brown. Cool completely. In a small bowl, combine confectioners' sugar and enough water to make a runny glaze. 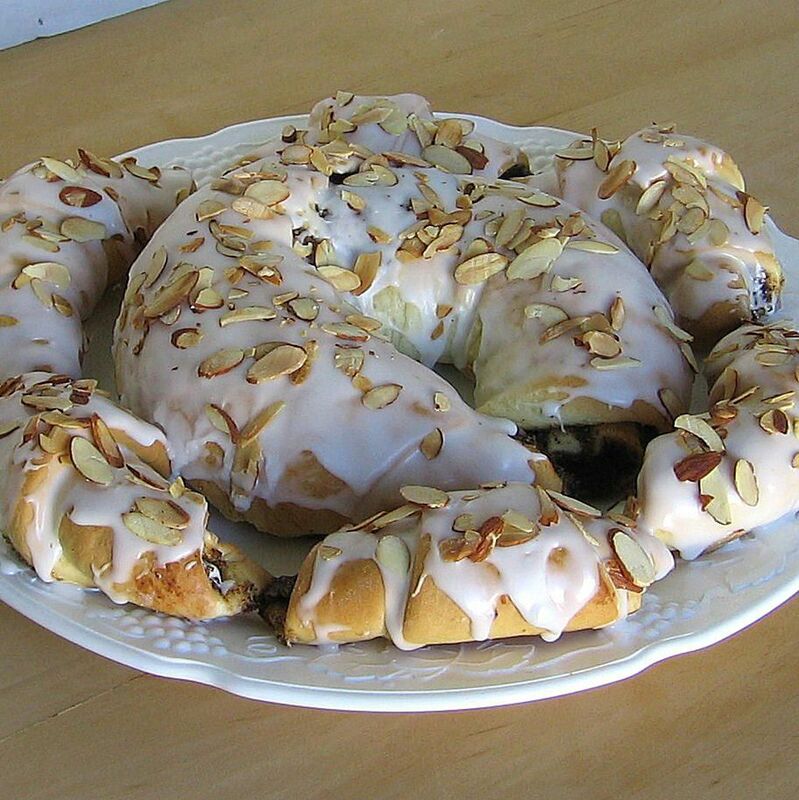 Frost crescents and sprinkle with toasted sliced almonds. Great with hot tea or coffee.